HARLEY QUINN T-Shirts which we offer at Plain-t-shirts.co.uk forms part of our movie, games and music official merchandise range. 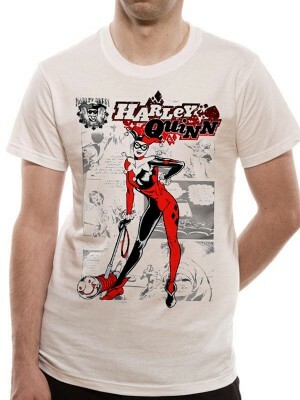 HARLEY QUINN range we offer fast delivery all over UK/EU HARLEY QUINN - KABOOM (UNISEX) which we offer which you can hav.. The character was created by Paul Dini and Bruce Timm, and first appeared in Batman: The Animated Series in September 1992. Harley Quinn is the frequent accomplice and lover of the Joker, whom she met while working as a psychologist at Gotham City's Arkham Asylum, where the Joker was a patient. Her name is a play on the name "Harlequin", a character which originated in the commedia dell'arte.